Janine frequented a little Afghan restaurant in New York’s Hell’s Kitchen before we were married. It was a low-key, nondescript place with about eight tables. A mismatched assortment of Afghan-themed decor adorned the walls. She brought me there on one of our first dates. The owner recognized her immediately and asked if she wanted the “usual”. A nod of agreement turned his attention to me. “I’ll have what she is having” was my reply. It turns out her “usual” was Kabuli Pulao with Lamb. 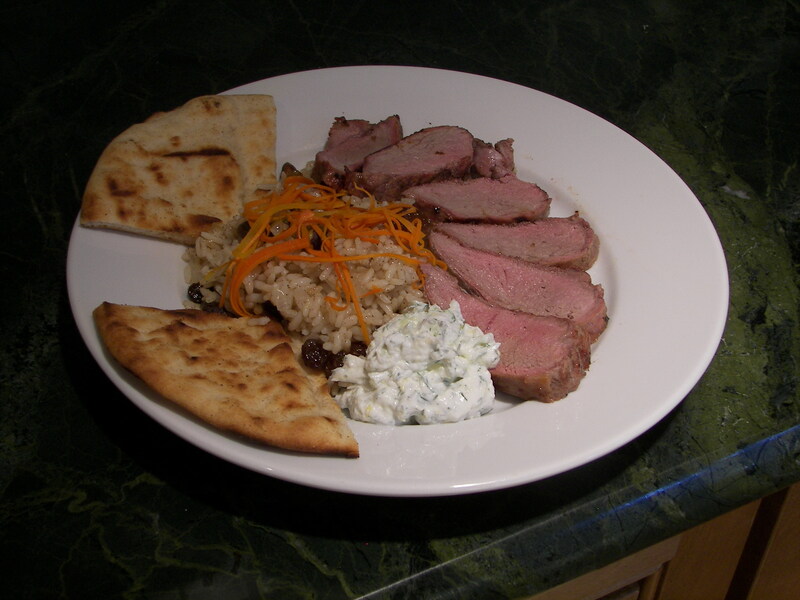 It consisted of grilled chunks of lamb nestled in a middle-eastern rice pilaf. The lamb was tender and mild. The pilaf contained pistachios and raisins which complimented the coriander, cumin, and cinnamon spice combination. The meal lingers in my memory to this day. I tend to order similar dishes whenever I see them on a menu and tried to recreate a version of it at home. The results of my best attempts are provided in the recipes below. I don’t quite know what about this dish appeals to me. Maybe it was the balance of flavors and textures. Or maybe it was the company I kept when I first tasted it. Either way, there is nothing “usual” about it. 1 – 5 to 6 lb Boneless and butterflied leg of lamb (See “How To” section for detailed instructions on how to do this yourself). Mix all of the ingredients together in a small bowl. Place boneless leg of lamb in either a brining bag (My preferred method) or a bowl large enough to hold both lamb and marinade. Spread marinate evenly over the lamb. Pour remaining marinade over meat. Seal the bag or cover the bowl. Place in the refrigerator for a minimum of 8 hours or overnight if possible. 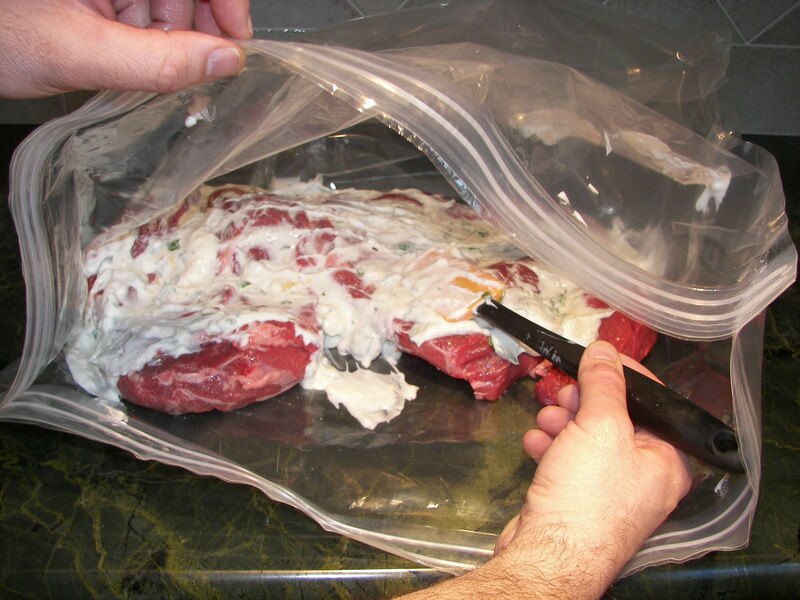 After ample time has passed, remove lamb from marinate and rinse off under cold water. Pat lamb dry with paper towels. 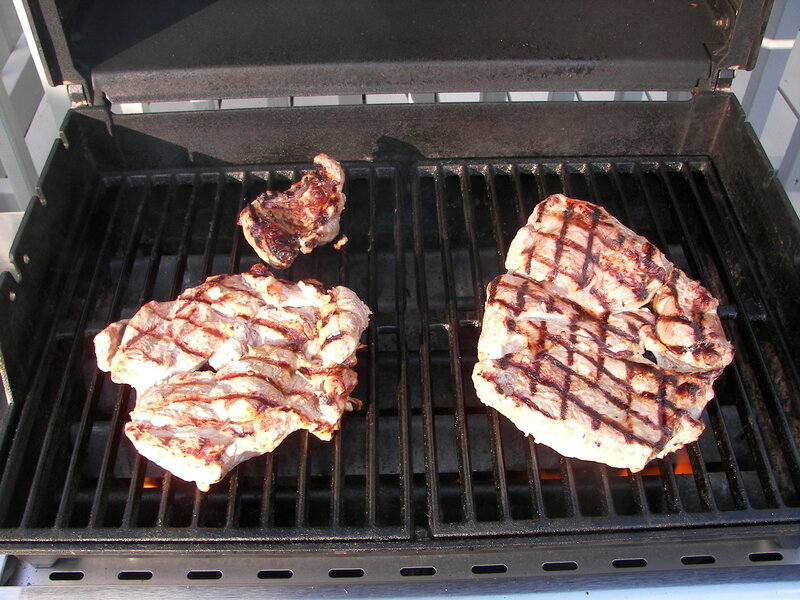 Cut lamb in half to make it easier to turn on the grill. Bring to room temperature. Meanwhile, heat the grill unit it is very hot. Coat the lamb lightly coating of olive oil. Wipe the hot grill with a light coating of oil and place lamb upon it. Grill lamb on both sides until it reached the desired level of doneness (An internal meat thermometer will read 145 degrees for medium rare. 160 degrees for medium). 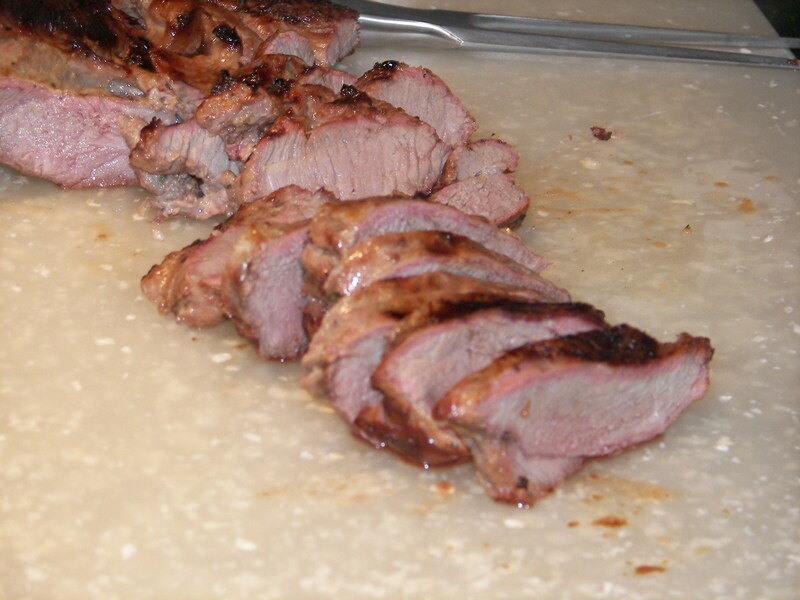 Remove lamb from grill and allow to rest at room temperature for about 15 minutes. Slice against the grain and serve with Tzatziki and Middle Eastern-inspired pilaf (Recipes can be found below). 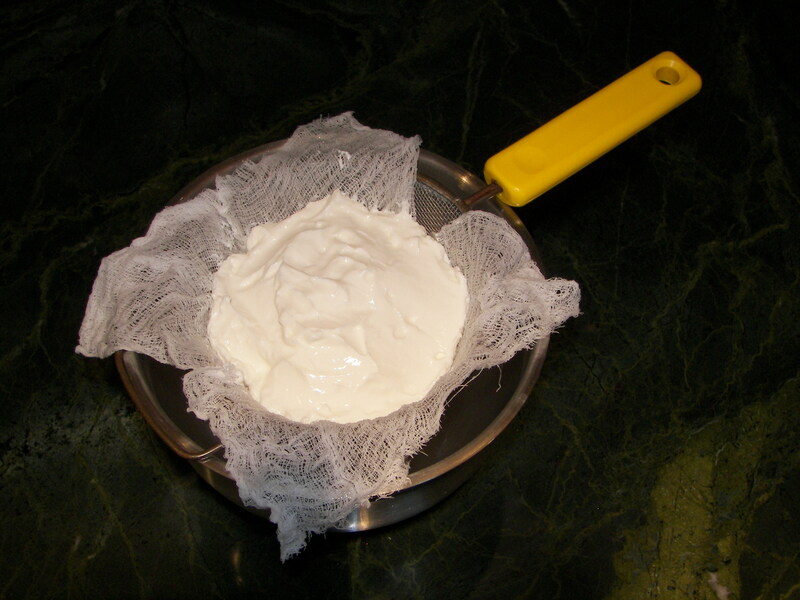 Line a small strainer with cheesecloth and set over an appropriate size bowl. Spoon the yogurt into the strainer and cover with plastic wrap. Put yogurt, strainer, and bowl in the refrigerator. Let stand for at least 4 hours. 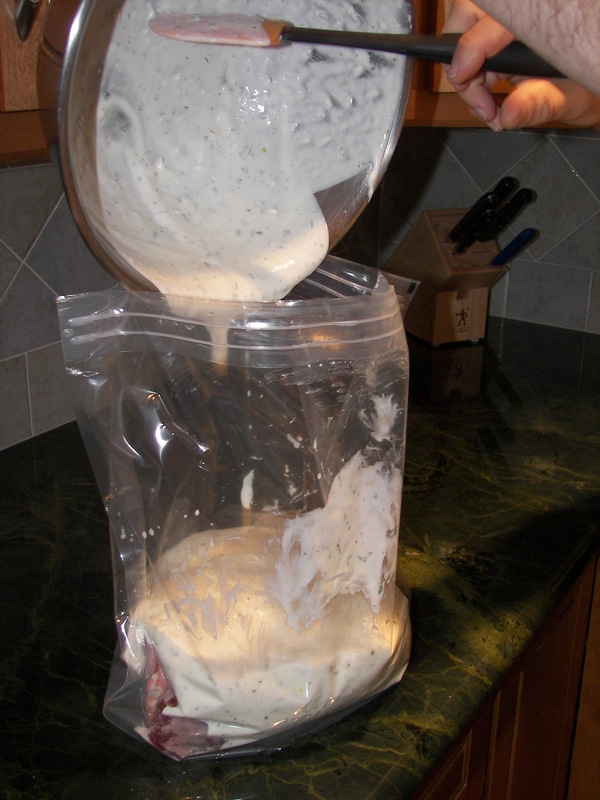 This will allow whey to drain from yogurt. Peel cucumber with a vegetable peeler and cut in half length-wise. Scoop out the seeds from both halfs. 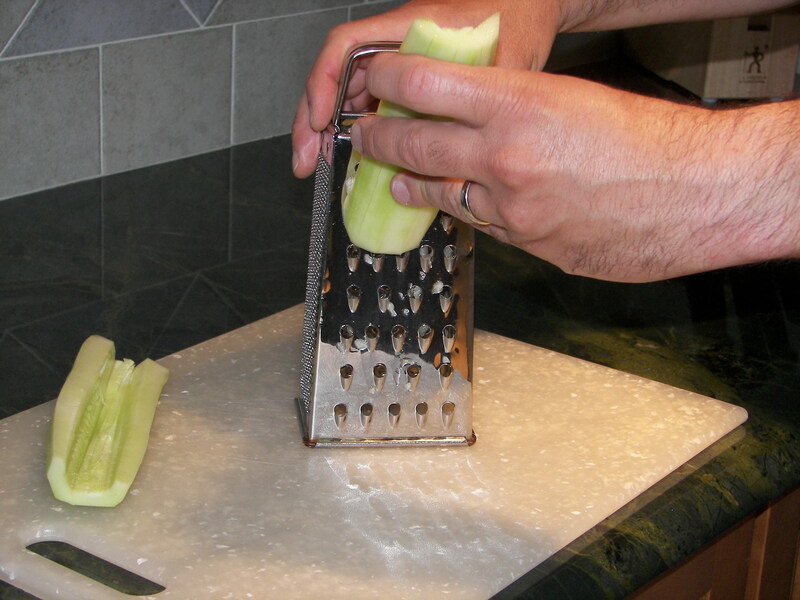 Grate the cucumber using the coarse holes on a box grater. Place grated cucumber in a small colander. Set colander into an appropriate sized bowl. Sprinkle with two or three large pinches of salt. 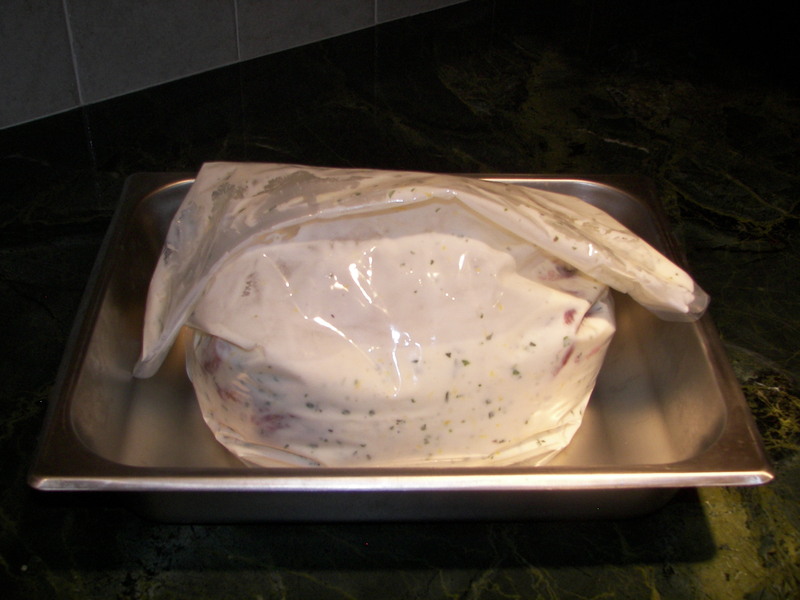 Cover with plastic wrap and place in refrigerator. Let stand about 4 hours or more. This will remove a significant portion of water from the cucumbers. 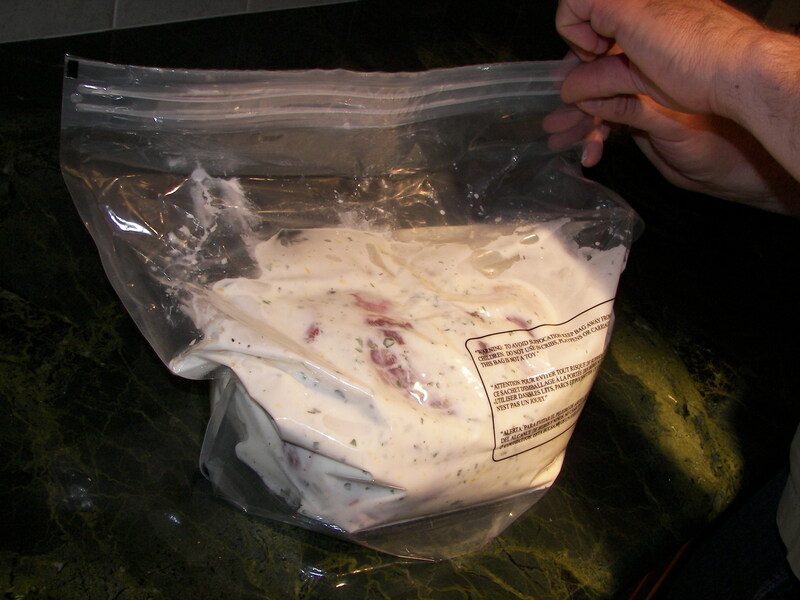 Remove yogurt from refrigerator and place in a medium-size mixing bowl. Discard the cheesecloth and whey that collected in the bottom of the bowl. Remove the grated cucumbers from refrigerator. 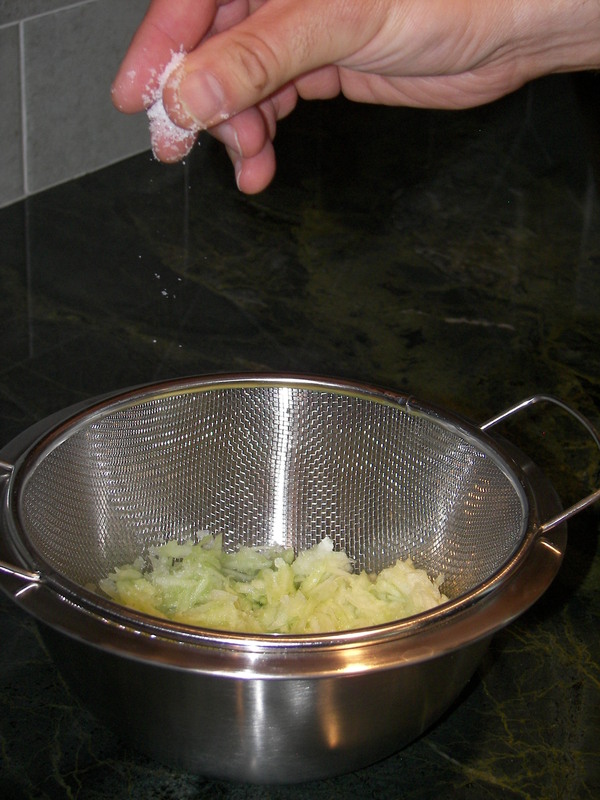 Lift the colander out of the bowl and discard any liquid that collected in the bottom. 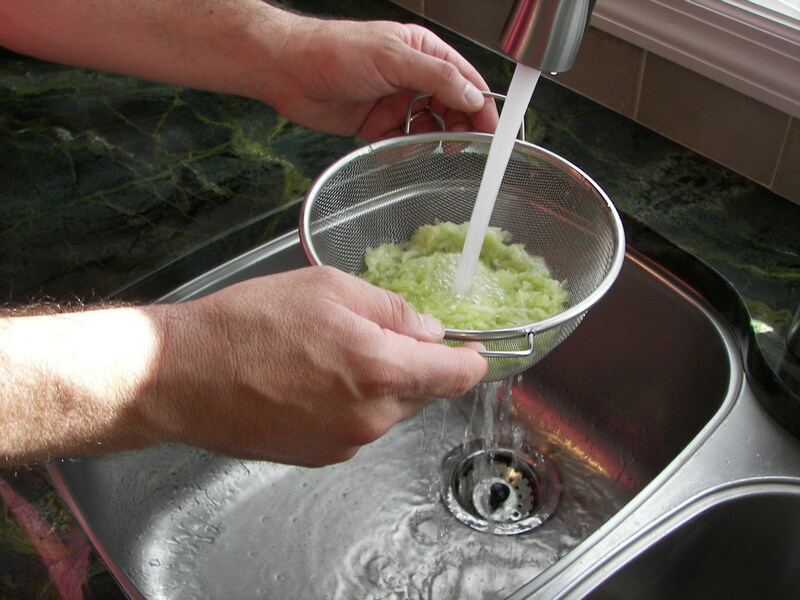 Run the Colander under cold water to rinse any remaining salt from the Cucumbers. Place the shredded cucumbers in a clean dish cloth and squeeze out excessive water. Place shredded cucumber into the bowl containing the yogurt. Add the finely grated Lemon zest, the lemon juice, and the olive oil. Stir to combine. Crush the garlic clove with the side of a chef’s knife. Add a big pinch of salt and mince until it is very fine. 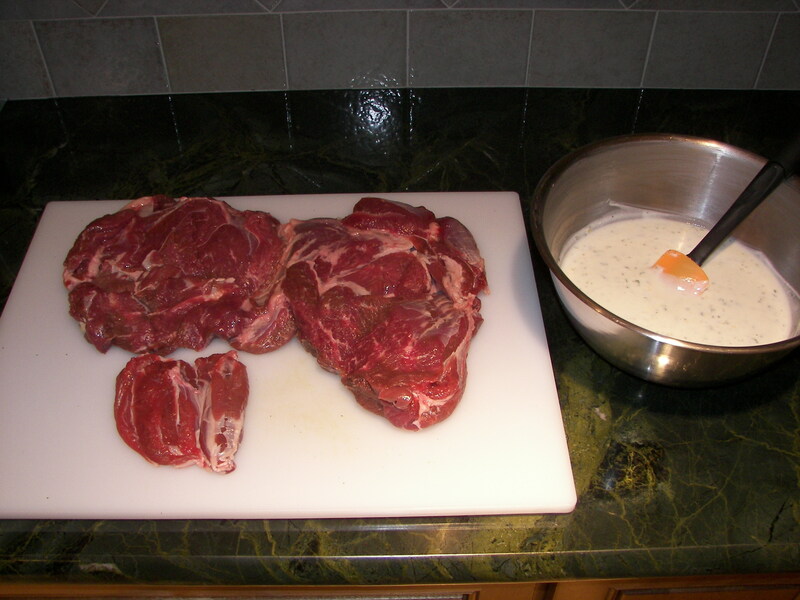 Mash into a paste with the side of the knife and add it to the bowl containing yogurt and other ingredients. Add the chopped dill. Stir the mixture to combine all ingredients. Season with salt and pepper. Taste the mixture and add either additional lemon juice, olive oil, or any other ingredient you see fit. Cover the bowl with plastic wrap and set in the refrigerator. The flavors come together as it sits. Note: If using Basmati rice, rinse throughly under cold water before adding it to the pan. To do this, place rice in a colander. Rinse under cold water until the water exiting the colander runs clear. Place 1 Tbs. of olive oil in a small sauté pan with a tight fitting lid. Heat oil over medium heat. Add julienned carrots and a pinch of salt. Sautee until just cooked through. Remove carrots from sauté pan and set aside, keeping them warm for later use. Add another 1 Tbs. of olive oil to the pan and the pistachios. Sprinkle with a little salt. Sauté the pistachios until thoroughly toasted. Remove pistachios from pan and set them aside, keeping them warm for later use. Add another 1 Tbs. of olive oil to the pan along with the raisins. Sprinkle with a little salt. Sauté until the raisins are soft and tender. Remove them from the pan and set them aside keeping them warm for later use. Add the remaining 2 Tbs. of olive oil to the pan along with the onions. Sauté over medium heat until onions become translucent. Add the Coriander, Cumin, Cinnamon, and a few grinds of black pepper. Stir over medium low heat until the onions are evenly covered with the spices. Add the cup of rice and stir until each grain of rice is coated with oil. Add chicken stock and stir to combine. Bring to a rapid boil, stir once or twice to ensure the rice does not clump. Cover the pan and reduce heat to the lowest possible setting. After the rice has simmered for 15 minutes, turn off the flame. Allow pan to sit off-heat for 15 minutes more. Please Note: Do not remove the lid for the entire 30 minutes of cooking time (15 minutes of simmering and 15 minutes of resting off heat). After the pan has stood for 15 minutes off-heat, remove lid, fluff rice with a fork, hold in pistachios and raisins. Spread carrots evenly across the top of the rice. Is the pilaf in any of the photos? Fae. We used to go to a little Afghan Kebab house in New York City. They featured a dish called Kabuli Palau. It consisted of fragrant basmati rice cooked with pistachios and raisins. It was delicious! The pilaf recipe we provided tries to capture some of the same flavors and textures. I don’t think we took pictures last time we made it but wil remember to do so the next time.